What makes a radio great? Actually, what would be your ideal radio? It should definitely play DAB stations. It would obviously need FM too. It would be nice if it had internet radio, via Wifi. Perhaps an app could help you pair it with your phone or tablet. How about Bluetooth thrown in there, just for the mix. And what about synchronization, so you can have the same music playing in all your rooms? Sounds a bit too good to be true, doesn’t it? Well it isn’t! 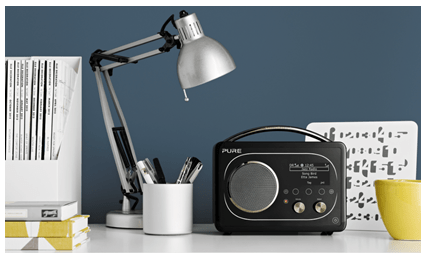 Pure have just launched the Evoke E4, which is another addition to their Jongo family of speakers. Priced at only £179.99, this is definitely the best set of features to be ever seen in a radio. And yeah, you have other things like ability to record to a USB memory stick, touch sensitive controls, timers, alarms, auxiliary inputs. London, 29th May 2013: Pure launches Evoke F4, a digital and internet radio with Bluetooth and the ability to stream a world of multiroom audio entertainment. Compatible with Pure’s award-winning Jongo multiroom music system, Evoke F4 (SRP £179.99) enables users to enjoy perfectly synchronised music throughout their home. As with all members of the Jongo family, Evoke F4 can be used on its own or grouped together with other Jongo speakers to deliver the most flexible and accessible multiroom audio system on the market today. Users can simply add extra Jongo speakers or adapters on the same Wi-Fi network to build their multiroom system. Bluetooth is included for casual streaming from mobile devices. Users can listen to a world of internet radio, digital radio or FM and are spoilt for choice with easy access to over 20,000 internet radio stations and 200,000 on demand programmes and podcasts from around the world. Music fans can stream over 15 million music tracks from the Pure Music subscription service* and those in search of relaxation can unwind to a selection of ambient sounds. When listening to the radio, users can benefit from Evoke F4’s innovative tagging technology by pressing the tag button to find out the track and artist name. Tracks can be bought there and then from the radio or at a later date from the Pure Connect website or added to a Pure Music playlist. All this audio content and locally stored audio can be streamed wirelessly from the comfort of the sofa to Evoke F4 via the Pure Connect app for iPhone, iPad and Android via Wi-Fi or Bluetooth. Audio from other apps can be streamed wirelessly to Evoke F4 via Bluetooth. Benefitting from Pure’s heritage of British design and engineering and trademark real wood casing, Evoke F4 delivers the best possible sound quality, using highly energy efficient Class-D audio amplification and in-house DSP (digital signal processing) loudspeaker correction, equalisation and sound profiling. Based on the multi award-winning Evoke Flow, the audio has been further refined with significantly increased detail retrieval, focus and resolution. Leading edge features Include recording live internet and digital radio to USB memory stick**; instant and timed recordings; touch-sensitive controls; large clear graphical OLED display; multiple alarms; a sleep and kitchen timer; input for an iPod or MP3 player; headphone socket; support for the optional matching stereo speaker (SRP £34.99) and rechargeable F1 battery pack (SRP £34.99) that gives 12 hours of portable listening per charge.